The test the court applied in in answering question one was the “clearly specifies” test. Under § 1056(d)(3)(C) “a domestic order meets the requirements of this subparagraph only if such order clearly specifies— (i) the name and the last known mailing address (if any) of the participant and the name and mailing address of each alternate payee covered by the order, (ii) the amount or percentage of the participant’s benefits to be paid by the plan to each such alternate payee, or the manner in which such amount or percentage is to be determined, (iii) the number of payments or period to which such order applies, and (iv) each plan to which such order applies.” In digging down to determine what exactly is meant by the term “clearly specifies” the court noted that it does not require “Simon Says rigidity or demands magic words.” The court went on to state: “One may ‘clearly specify’ something by implication or inference so long as the meaning is definite. See Oxford English Dictionary 159 (2d ed. 1989) (To specify means ‘to mention, speak of, or name (something) definitely or explicitly’); Webster’s New International Dictionary 2415 (2d ed.1934) (‘to mention or name in a specific or explicit manner’).” An everyday example of this point that the court mentions is that one may clearly specify to a grocery cashier when asked “paper or plastic?” by stating either “paper” or “not plastic” to effectuate the same outcome. Here the court concluded that “a similar approach, informed by common sense and context, applies to the naming of the beneficiary of a life insurance policy. The statute does not require that a particular provision of the divorce decree clearly specify the relevant details.” The court then applied the “clearly specifies” test to the divorce decree and found it passes the test being that it incorporates both the separation agreement and shared parenting plan. They identified the parties and listed their addresses. Article IX required the father to maintain life insurance “naming their minor child as primary beneficiary.” Page 1 stated that “[t]he parties have one (1) child born the issue of this marriage, namely: Sierra N. Jackson, born February 9, 1995.” The court concluded that the “agreement thus clearly specifies Sierra Jackson as the alternate payee.” Article IX specifies that father shall maintain “all employer provided life insurance . . . naming their minor child as primary beneficiary.” As to plan identity, Article IX identifies “all employer-provided life insurance.” Therefore, the daughter prevailed and the proceeds from the policy were paid to her with interest. The aforementioned litigation could’ve been avoided through a diligent post-judgment follow-up by the parties. It is important that litigants and their counsel make sure the provisions of a settlement agreement are indeed followed through by the parties. 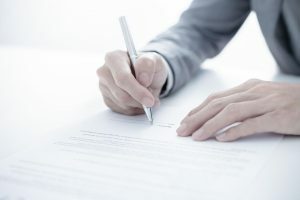 If one party is not following the agreement, it imperative to address the issue through the filing of a Notice of Motion to Enforce Litigant’s Rights or through methods alternative dispute resolution.